My friends Megan and Chris had a quilt party with me this weekend. Chris was at work today and Megan and I finished up some of the projects started Sunday. What did we manage? 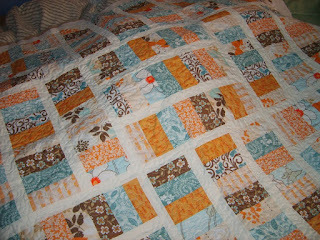 Megan and I made cute matching baby quilts using Oh, Fransson's charm square baby quilt pattern. This is M's second quilt and it looks fab! She picked up the cutest cat fat quarter pack and is making one for her friend's new baby too. I made one using some random charms from (mostly) the canning day collection from Connecting Threads. I think it is discontinued now but it is very sweet for a baby! I also picked up binding and finished my Sugar Pop-N-Change quilt! I've blogged this baby before! And I finished my blocks for the 36 Patch Quilt Along hosted by Crazy Mom Quilts! Actually, I finished the last four AND put all the blocks together! I love this quilt! Overall it was a lot of fun. I love checking projects off of the WIP list! 36 Patch QA - Almost there! I've taken the last couple of afternoons off from work (work = finishing up final edits on my dissertation) to work on this QA. I didn't realize that finishing my diss would be soo stressful but it is. I don't have a "real" job yet and there is a part of me that feels like I failed. Anyways, enough pitty party: I've been sewing for fun AND I have a date with my sweetie tonight! From these sets, I finished the blocked needed to get to 12 finished blocks. I'm kicking QA tushie! Here is a peak at what the quilt looks like. I think it is going to be tricky to lay this one out, due to the dark/lights being yellow in many blocks inconsistency. However, there are enough yellow-free blocks that I think it can be done! Refreshing, right? This is the perfect top to work on in this heat. I know I am totally nuts, but as I was editing my dissertation and thinking about this QA I thought, you know, just do it! I always missed other QA that I wanted to do, either because I found it late or because I had 10000 other things going on. I decided to make a test block to see how long it would take. About 30 minutes! I can manage that in a day, especially knowing that I'll get faster once I do more at a time! The leftovers are mostly yellows, limes, and some hot pinks. Lots of the flower prints too! I think this was 3 or 4 strip sets that I ended up doing 3 projects with. The other I'll post then it is done! So here is my first block. 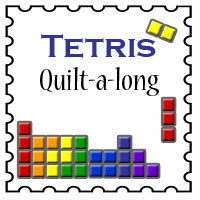 Thinking of doing 16 blocks for a 4x4 baby quilt. I'll see what happens! I forgot the check the directional prints... ha ha, I think it gives the block some character! This is another of my current projects. My mom asked for a quilt (well, I kind of offered to make her one too!) 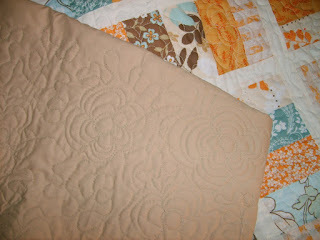 and I decided on the "Raspberry Ripple" quilt from Layer Cake, Jelly Roll & Charm Quilts. Of course, mine is not raspberry by any means. Mom wanted greens and purples and I picked up some Sip of Summer strip sets from Connecting Threads to make it happen. I pulled all of the green/purple strips out for this quilt and left the red/orange/yellow ones for another project I'm working on. I picked a light brown Kona solid for the solid color (I think it is Khaki?) and set to work. I'm doing the quilt just under queen sized, so there are a zillion blocks to make. You can see some half square triangles that I have finished along with some sets to make nine-patch blocks. And, of course, I did the math AFTER I started sewing and realized I needed 10 more blocks than what my current supply would allow so I have some more strips to sew up and chop into nine patch blocks. The bright side is I can use that pretty flower print in the quilt now! I think my mom will like it. I've been on the hunt for a long arm quilter to do the top - there is no way this beast is going to fit into my little Brother! 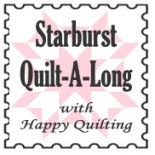 Alternately, maybe this is my chance to justify getting a mid arm machine so I can quilt it myself. Choices, choices.... I like to do things myself (sewing, home repair, cooking, you name it! I would make a good husband AND wife!). Sugar Pop N Change - Almost done! So I've been a little MIA lately. The good news is that I'm doing a little crafting. The better news is that I will officially be "Dr. Beeps" in two weeks! I've been working on getting my dissertation polished up and ready to defend. Sweet! I got all my blocks together for my Sugar Pop N Change quilt over the weekend and spent time between editing my diss doing some free motion quilting on it. I decided to try something new and went with a flower pattern. I think it turned out pretty well, considering this is my second free motion quilt job AND my machine has a little neck! The fabric are precuts from Joanns. I hated working with them and learned my lesson :) This is the "Neutral Mediterranean" line from Fabric Central. The price was right but I didn't like the pinked edges - it made it hard for me to get my seams right. The sashing I found in my stash and is a cream broadcloth. 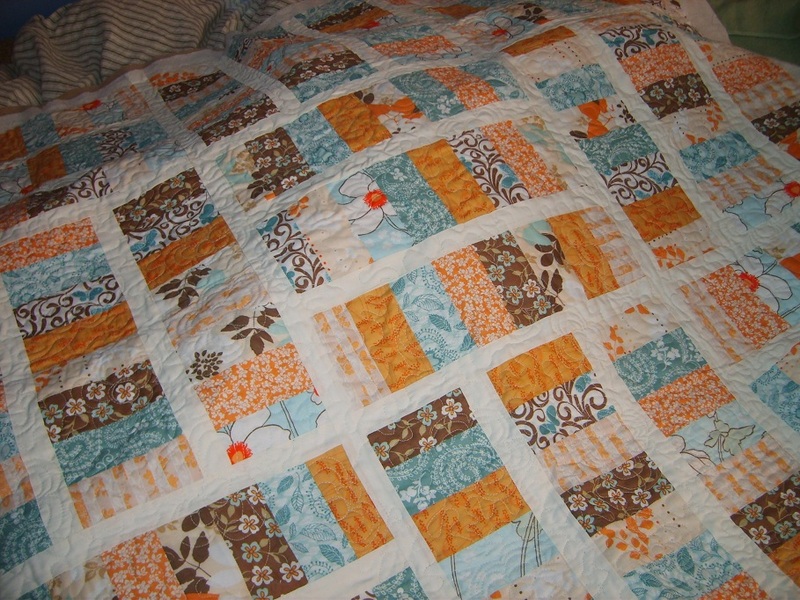 For this quilt, I used one jelly roll (20 strips) and 1 charm pack (I think it had 30?). Anyways, I had enough for the quilt top plus a couple leftover bits. My goal for the rest of the summer is to take care of all my WIP that I have. I love to start projects and get distracted by new ones! I can count/think of 14 WIP I have, ranging from finished tops that need to be quilted to yummy stacks of fabric that is ready to be chopped up and turned into something awesome. I have three charity quilts that are going to be first priority after I bind this and get it to my sister (late, late holiday gift!). I also have a top for my mom I'm armpit deep in blocks for. It will be a fun summer - good thing I have a lot of housesitting to do at my friend Megan's house - it has HUGE floor spaces perfect for laying things out and three sweet kitty boys to keep me company and "help out" with my designs!